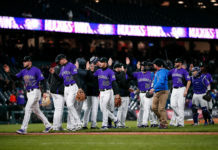 Colorado Rockies (46-44, third place in NL West, 8-2 in their last 10 games) vs. Arizona Diamondbacks (50-41, first place in NL West, 3-7 in their last 10 games). Anderson (8.0 IP, 2 H, 0 ER, 9 K) was dominant in his last start Wednesday against the Giants. He has now struck out 18 batters in his last two starts, both including eight shutout innings. Anderson has won three of his last five starts, including two straight against a divisional foe. Corbin (6.0 IP, 6 H, 1 ER, 6 K) was left with a no-decision in his last start Wednesday against the Cardinals. His ERA over his last three outings is an excellent 0.95 (2 ER in 19.0 IP). Corbin’s 140 strikeouts and 3.05 ERA leads the Diamondbacks. Marquez (6.0 IP, 5 H, 1 ER, 5 K) earned the win in his last start Friday against the Mariners. Marquez did not allow a hit until the fourth inning and was able to lower his ERA to 4.92. The performance lowered Marquez’s road ERA in nine starts to 2.62. He is tied for second on the team in wins with seven and his 9.09 K/9 currently leads Colorado starting pitchers. Miller (5.1 IP, 5 H, 3 ER, 7 K) took the loss in his last start Thursday against the Padres. Miller has been disappointing for the Diamondbacks since coming off of the disabled list (0-3, 9.00 ERA). He has given up 16 earned runs, with 20 hits across the three starts and he is giving up hard contact 61% of the time. Freeland (5.0 IP, 5 H, 1 ER, 4 K) was left with a no-decision in his last start Saturday against the Mariners. Freeland will carry a respectable 8-6 record with a 3.18 ERA and 1.21 WHIP moving forward. His 3.18 ERA and eight wins rank best amongst Colorado starting pitchers. Godley (6.0 IP, 4 H, 1 ER, 7 K) mowed down the Padres’ lineup in his last start Friday. 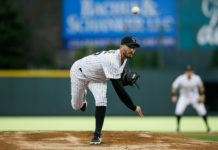 Godley has gone 5-1 over his last six starts, giving up two earned runs or fewer in all five of the victorious efforts. He leads the Diamondbacks in wins with 10 and is third on the team in strikeouts with 101. Carlos Gonzalez was a big factor (5/12 H/AB, 3 RBI, 1 HR) for the Rockies in Seattle, where they took two of three from the Mariners. Gonzalez has played solid baseball for the Rockies this season (.274 BA, 8 HR, 32 RBI, .323 BA at home) and has hit safely in his last six games. 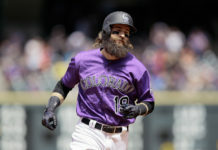 Charlie Blackmon (4/14 H/AB, 2 RBI, 2 HR) hit a pair of dingers in Seattle last weekend and has been heating up of late (9/26 H/AB, 3 HR, 5 RBI). 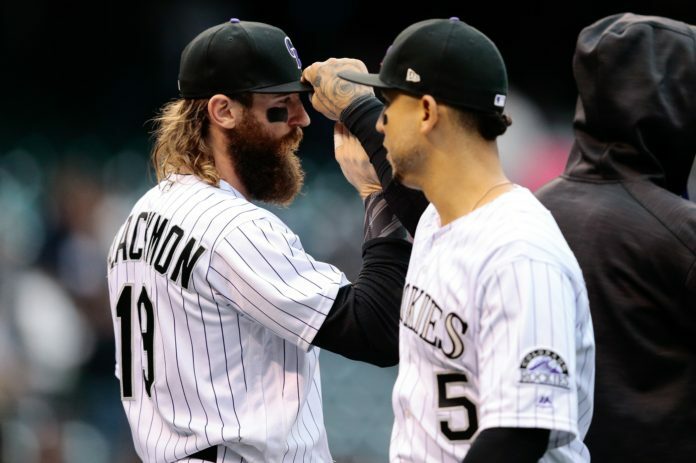 Blackmon carries a respectable slash line of (.276 BA, 17 HR, 40 RBI) and was recently named a 2018 NL All-Star. Trevor Story has continued to have a career year (.284 BA, 17 HR, 62 RBI, 11 SB) and was recently named a 2018 NL All-Star because of it. Story currently leads all National League shortstops in HRs, RBIs, SLG% & XBHs. Paul Goldschmidt has been on fire for the Diamondbacks lately (13/29 H/AB, 2 HR, 7 RBI) and his slow start to the 2018 season seems like a distant memory. Goldschmidt is slashing (.281 BA, 20 HR, 51 RBI) and is hitting an incredible (.376 BA, 13 HR, 32 RBI) over his last 34 games. David Peralta went 5-for-6 with three runs scored and three RBI in Arizona’s 20-5 win over the Padres on Saturday. Peralta is (10/23 H/AB, 5 RBI) and has a respectable line of (.291 BA, 15 HR, 49 RBI) on the year. Daniel Descalso went 3-for-5 with two doubles, two RBI, and scored three runs against the Padres on Saturday. Descalso is (5/14 H/AB, 2 XBH, 2 RBI) and has played a nice utility role for the Diamondbacks this season. He currently holds a (.259 BA, 9 HR, 44 RBI) slash line. Ian Desmond has been cold recently (4/23 H/AB, 0 HR) and has been unable to find his groove for Colorado this year (.214 BA). Through the end of May, Ian Desmond was batting .196 and was striking out in 25.7% of his plate appearances. He has been able to bring his average up a bit lately, but the season has still been a long tailspin for Desmond. Gerardo Parra (3/14 H/AB, 0 HR, 0 XBH) has cooled down recently, but his (.300 BA, 5 HR, 39 RBI) has given the Rockies some options in their crowded outfield. Raimel Tapia is just (1/5 H/AB, 1 XBH, 0 RBI) since being called-up to the big leagues this year. Tapia hit a respectable (.288 BA) last year and unless his 2018 numbers can duplicate that, he may be sent back down to Triple-A. Jake Lamb has been ice-cold for the Diamondbacks (5/27 H/AB) and has been unable to contribute offensively this season (.234 BA, 6 HR, 28 RBI). Lamb finished Arizona’s weekend series vs. the Padres 1-for-15 with a pair of walks, three runs, and an RBI. Steven Souza Jr. is just .148 BA, 1 HR, 5 RBI at the plate this season in 61 AB. Chris Owings (.189 BA, 3 HR, 18 RBI) has struggled tremendously this season for Arizona after hitting .268 BA, 12 HR, 51 RBI with the club last year.